Erie's biggest film festival returns just in time for the Halloween season. The past decade hasn't been the easiest time for people starting a new business. In fact, it can be downright scary, with more than half of all companies closing by their fifth year, according to the U.S. Census Bureau. However, frightening prospects can sound enticing to a person who wants to start an annual event dedicated to celebrating a love of horror and independent cinema. So in October of 2004, the Eerie Horror Film Festival and Expo debuted in The Flagship City, where it remains to this day and kicks off this year on Friday, Oct. 18. "The fifth anniversary I was ecstatic about; the 10th anniversary is like a dream come true," Eerie Horror Fest President Greg Ropp says, his excitement for the upcoming milestone bursting through my phone speakers. "I used to run a family business, and one of the things you always hear when you start a small business is that if you make it three years, you're doing good, because most businesses fold in the first couple of years they exist. That's definitely true of festivals and any kind of event. You'll see something pop up in Erie and the region and it's gone the next year or it goes two years and disappears and then people forget about them." There are many words you could use to describe the Eerie Horror Fest, but forgettable is not one of them. Since it started out at The Roadhouse Theater back in 2004, the three-day celebration has brought a wide array of films and icons appealing to both the self-diagnosed film nerds of the world as well as those interested in seeing something a little, well, different than what your average annual event can provide. Of course, in October, the unusual seems rather appropriate with Halloween lurking around the corner, and the Horror Fest provides plenty of spooky intrigue as well as insight for film fanatics. There are seminars with ghost hunters, film shorts about a cannibal trying to quit "cold turkey," and a feature that was designed to be the "Star Wars" of horror movies. Fans have been able to meet celebrities like "The Boondocks Saints" stars Norman Reedus and Sean Patrick Flanery, as well as "Clerks" favorites Jason Mewes and Brian O'Halloran, all in the historic Warner Theater, a location quite fitting for the Fest. "From day one, I said that it looked like a place where a horror event should take place," Ropp says. "The Phantom of the Opera should be popping out from around the corner of a chandelier." Ropp wasn't alone in his thinking, as the Horror Fest had caught the eye of Erie County Convention Center Authority Executive Director Casey Wells back when it was still held at The Roadhouse Theater. Wells saw an opportunity to add what was quickly becoming an Erie tradition to the Warner's events. "Casey said to me something pretty cool. 'Greg, go to another theater, a bigger venue, and prove to me that you can sell out a few shows. Prove to me that you can do this.' I really took that to heart. I think he remembers that conversation, but not as well as I do. For me, as a kid who really loved the Warner – I'm a movie guy, so that's the crown jewel of Erie for me – I took it to heart." 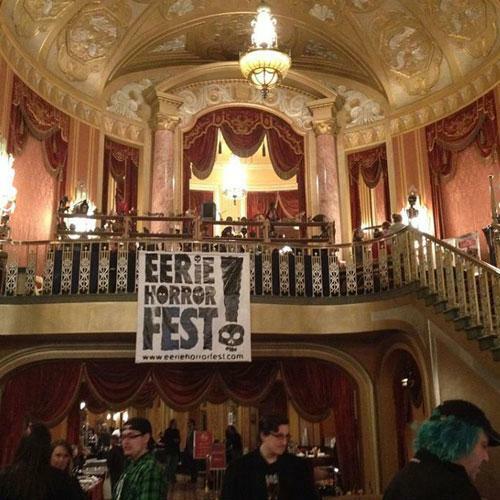 In 2006, the Horror Fest moved to the Erie Playhouse. Two years later, a contract showed up in Ropp's mailbox and the event moved to its present-day home in the Warner Theater starting in 2008. "He had been producing the Eerie Horror Fest at another local venue, much smaller, and I told him that we'd love to work with him to get the show into the Warner," Wells says of his interest in the growing event. "I felt that the show had a greater opportunity to grow if it were in our venue. He was very excited, of course Greg's very passionate, and he made the leap, and we're thrilled to have him." Much like the upcoming 10-year anniversary of the Horror Fest, the move was a dream come true for Ropp and his trusty crew of regular workers and volunteers. While many festivals are held in Holiday Inns and other hotels, the Horror Fest calls a 2,250 seat historic theater with gorgeous interiors its home, one that famous guests from Los Angeles and New York City stare at in awe when they walk through the front doors for the first time. Still, keeping the event alive wasn't always easy with budgets being tightened. Sometimes he would run into problems with the guests, including one notorious year when Corey Feldman was paid to appear and never showed up, much to the chagrin of excited fans. Ropp says that the last-minute cancellations used to bother him back in the Roadhouse years, but he's come to accept them as part of the business, especially when the celebrities discover more lucrative filming opportunities, even if some fans may be bummed out by missing higher-profile names. In the end it's just business as usual, and the Horror Fest still has to sell tickets in order to continue its now decade-long run. "It's good to have that staple event that you can count on year in and year out," Wells says. "It appeals to a certain demographic in the region that will come to every Horror Fest, but I think it's incumbent on Greg and the facility to continue to grow that audience. They have their loyal core of fans, but we have to continue to grow that base by offering a fun event. Ultimately the market decides what's viable and what isn't viable." So far, the market approves of the Horror Fest, although that won't stop Ropp from continuing to grow the event. Being the 10th Anniversary event, the Horror Fest will welcome back some old names, like last year's guest Vernon Wells from "Mad Max 2: The Road Warrior." Joining him will be film and TV veteran C. Thomas Howell and Doug Bradley, the man many horror fans know as "Pinhead" from the "Hellraiser" series. Films include "Adjust Your Tracking," an award-winning documentary on modern-day VHS culture made by Dan Kinem and Levi Peretic, a pair of Edinboro University graduates that Ropp says "grew up on the Horror Fest." Soon he hopes to go into film production and to help set up distribution channels. "I'm trying to do something really good for the community and be a small part of that whole experience that Erie will have to embrace," Ropp says of the Horror Fest. "We had a joke that I'm going to get a T-shirt that says 'We're bringing culture to Erie even if you don't want it.' Every time I say that, people laugh." Yes, the Horror Fest may not be as high-class as seeing the Erie Philharmonic, but it's not often that you can meet celebrities, see independent films, and attend educational seminars all in one beautiful historic location. Whether you're an admitted nerd or an intrigued individual looking for a wonderfully weird event, the Horror Fest might be the event for you. "It's my baby, it's my kid, and my kid is becoming a teenager now. Eventually, you groom this thing, you nurse this thing, you've made mistakes with this thing, and hopefully the Horror Fest will become a gangly teenager that will take on a life of its own and probably be really rebellious." It can be expensive raising a family, and the Horror Fest is no exception. Ropp and his loyal crew have nurtured the event from its Roadhouse infancy and have seen it develop into a growing destination for locals and out-of-towners. It hasn't always been easy – or cheap – but the Eerie Horror Fest is an institution that we can embrace for all of its weirdness, for as long as it stays in operation. "I'm going to look forward to our 25th anniversary, which means I'll be using my walker and my cane and my Depends, but I hope we make it." The Horror Fest has already beat frightening odds to grow into one of Erie's beloved annual events, so a few more years shouldn't be all too hard of a challenge. The Eerie Horror Fest starts its three-day run Friday, Oct. 18 and willrun through the weekend, closing Sunday, Oct. 20. All-access passes can be purchased at eeriehorrorfest.com. Alex Bieler can be contact aBieler@ErieReader.com, and you can follow him on Twitter @Catch20Q.